1. Heat a small quantity (Â¼) cup of water until it boils. 2. Put ½ to 2 teaspoon (depending on how strong you want to have the coffee) of BRU instant coffee in it. 3. Stir the solution and ensure that there are no lumps of coffee. 4. Boil Â¾ cup of milk and bring to boil. 5. Add the coffee mixture to the milk and add sugar as per your preference. 6. While the coffee is still boiling hot, pour it into a mug or, preferably, a stainless steel tumbler. While pouring the coffee, slowly raise the saucepan until the coffee falls into the mug/tumbler from a height of about 1 to 1½ ft. This will cause the coffee to froth (like espresso). 7. 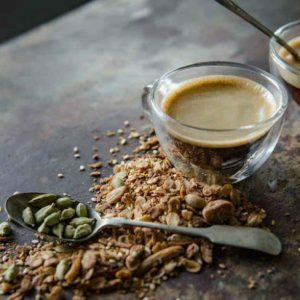 You can dip a teaspoon in the coffee and lightly spread a few drops of it over the froth in the mug. NOTE: Filter Coffee is actually made in a closed steel container called a coffee filter. Coffee percolates into hot water. 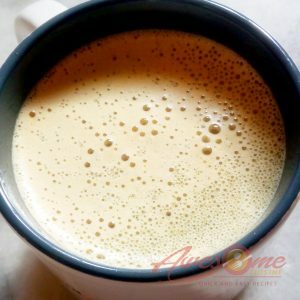 Feel free to comment or share your thoughts on this Madras Filter Coffee Recipe from Awesome Cuisine.